The balustrade at the front of the old brickworks has featured before on this blog but here we have a particularly fine photo of it. Sylvia at the brickworks – clearly showing the balustrade. Unfortunately, we don’t have a date but the back of the photo tells us that the little girl was called Sylvia. The balustrade is the main focus here. This had been designed by Mr Box, when he owned the brickworks, for use at Market Lavington Manor, built in the 1860s. There is a possibility that a dispute arose between Box and Pleydell Bouverie – who was having the Manor built and it is possible that Mr Box was not properly paid for the Manor’s balustrade. Anyway, he decided to use the same pattern and make a similar balustrade for his own house, by the brickworks on Broadway. Pleydell Bouverie was incensed by this. He claimed that a promise had been made that this pattern would only be used at his grand Manor House. Box was ‘invited’ to remove the balustrade from around the brickworks. Box refused. The result was a court case which found in favour of Mr Box who thus kept the balustrade. Sad to say, it is no longer there. But photos keep its memory alive. 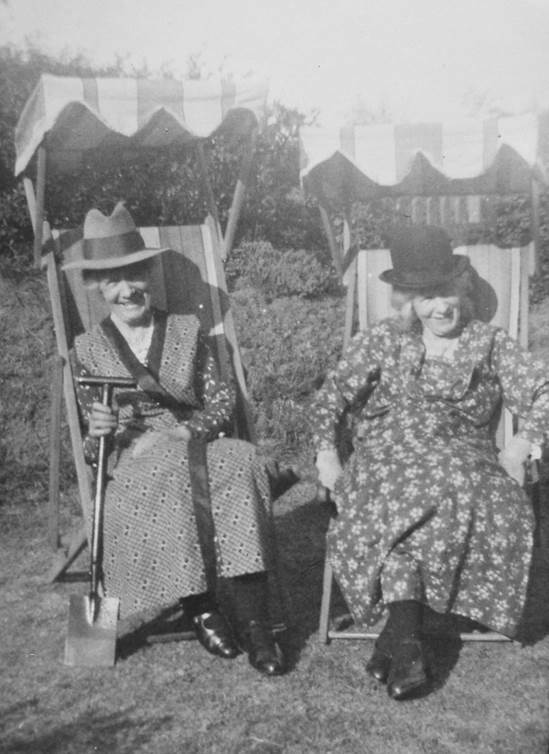 We don’t need a reason for showing this charming photo of a couple of ladies enjoying the sunshine. But the photo was taken at 21 Spin Hill in Market Lavington despite the somewhat seaside look of deck chairs and a smallish spade. And Mary was a Market Lavington lady. Both ladies seem to have borrowed hats from the men. 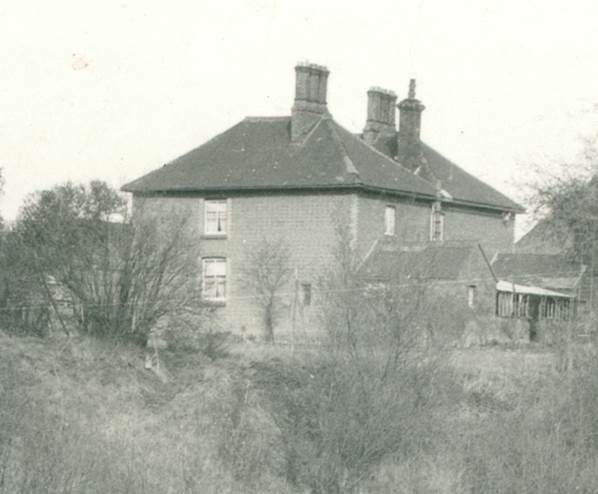 Mary Davidge was a Hibberd by her West Lavington birth but she married Edward Davidge in 1888 and at some point he got a job at the brickworks and the Davidge family moved into one of the Brickworks Cottages at Broadway. Louisa Hibberd may have been a sister of Mary’s or possibly a sister in law. We really haven’t located who she was. Neither do we have a date for the picture but we’d guess at 1920s. At the time of writing we think Tom George may be the oldest surviving person who was born in Market Lavington. Tom was born in the spring of 1920. His parents were Albert George and his wife Florence (née Ailes). Neither of Tom’s parents were local people. They moved to Market Lavington from the London area when Albert got the job of manager at the brickworks sometime between 1907 and 1910. 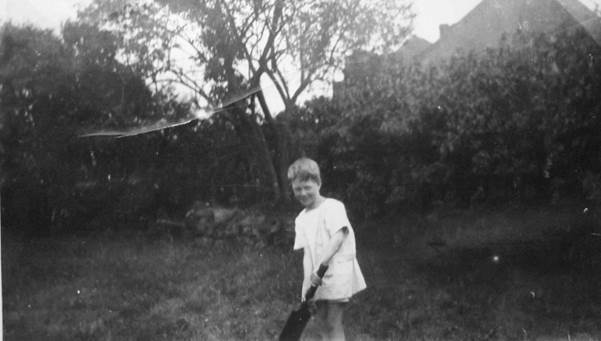 We were recently given a photo of Tom George in the garden at the brick manager’s house. 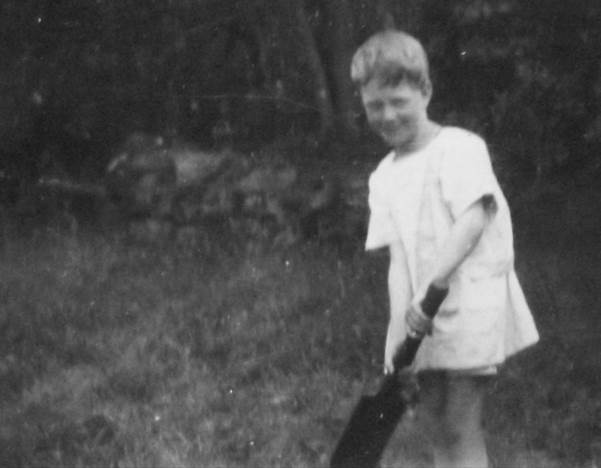 So there we have Tom, complete with a cricket bat which looks to be a few sizes too big for him. The back of the photo is captioned. 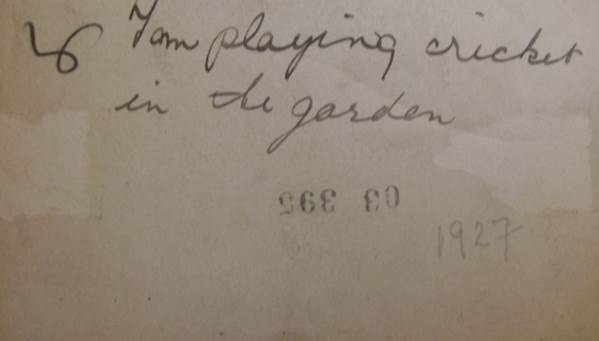 So we have a date of 1927 when Tom would have been seven years old. Tom still lives fairly locally and we hope to record an oral history with him. There were all sorts of buildings at the brick works, down on Broadway. Today we look at one of them which, when the photo was taken, began to look like a bit of a tumbledown hut. But it was a hut with history. This hut was known as ‘The Aerodrome Hut’. This may seem an unlikely name. It was acquired, by the brickworks in 1922. It had been (perhaps) an aeroplane hangar at the Stonehenge airfield. 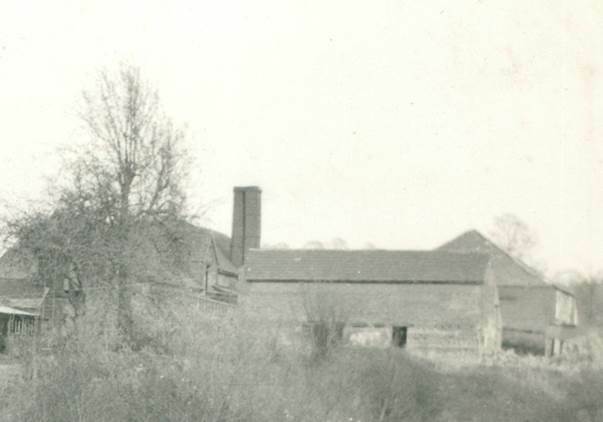 The photo itself dates from 1958 which is long after the brickworks closed. Although the back of the photograph says this was a hangar, it looks rather small. Is there anybody out there who can tell us any more about original uses for the hut or, indeed, what our own local brickworks used it for? 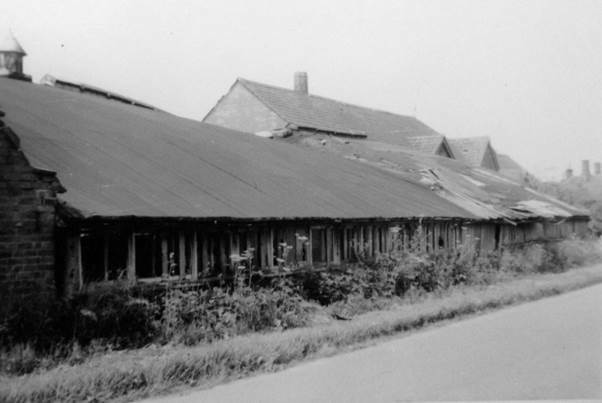 This photo is said to have been taken soon after the brickworks closed in 1948. There is some dispute about when production actually stopped. 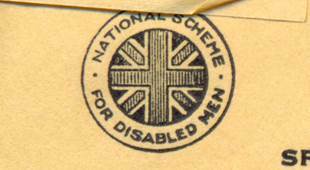 There is evidence that it was closed by government decree near the start of World War Two but perhaps the winding up of the company took place after the war ended. People in their 80s remember it in operation. One such lady recalls being allowed to operate the wire cutters that produced brick shapes from the clay. This photo is definitely a reminder of times long gone for our older residents. 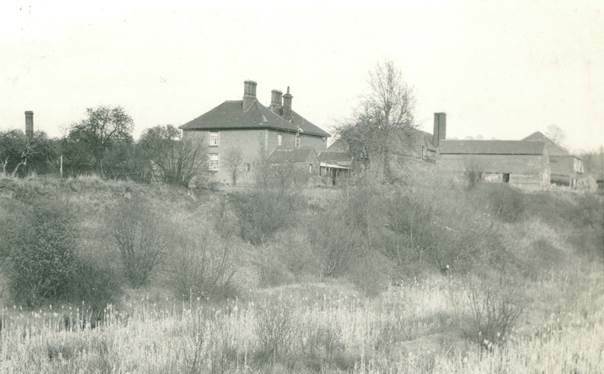 This must have been taken from somewhere slightly to the west of the old brickworks and it shows the brickmaster’s house, roughly in the centre. Further to the left there is a chimney which reminds us that the brick company occupied both sides of the road at Broadway. 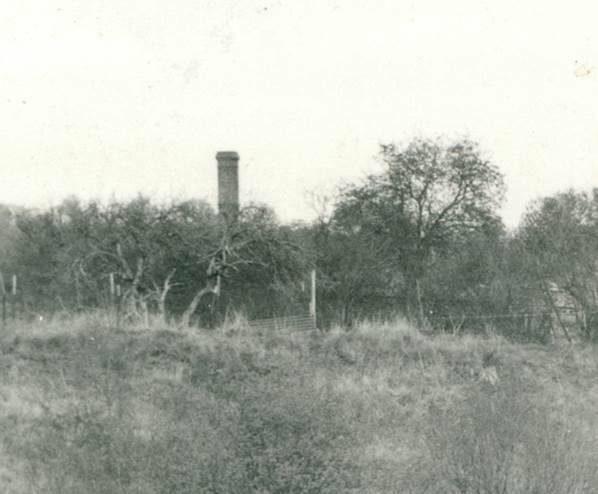 There’s no sign of any brickworks across the road now but in 1948 a chimney was there. All remnants of the old brickyard are now on the southern side of the road. One of those ‘remnants’ is the main brickworks building which still exists as a part of the ATAC analyser business. Brick making may have gone but it is good to report that industry still flourishes in the Broadway area of the parish. Today we return to that wonderful Lavington Forum magazine from 1949 and feature an article about Lavington brickworks written by two Michaels – Baker and Sainsbury. 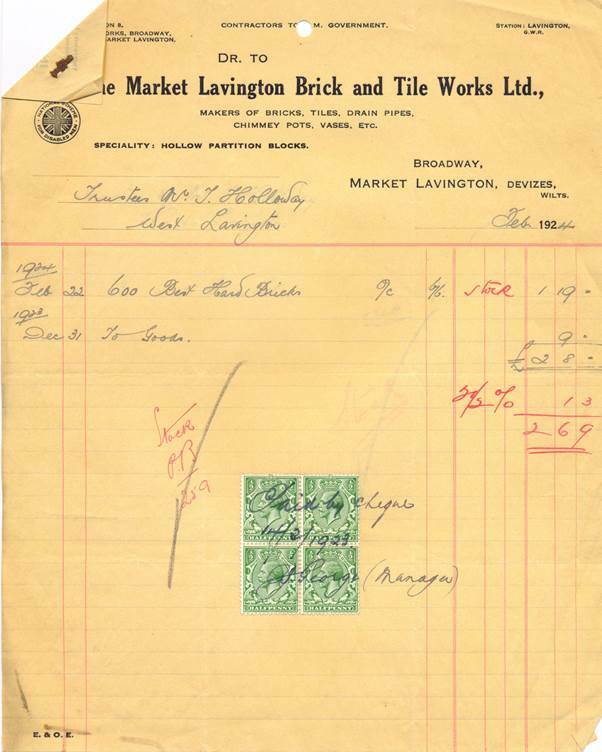 On Tuesday 3rd of May 1949 we paid a visit to the Market Lavington Brickworks where we were shown, by Mr George the manager, the processes involved in brick making. The clay is dug out by hand and heaped up to weather. 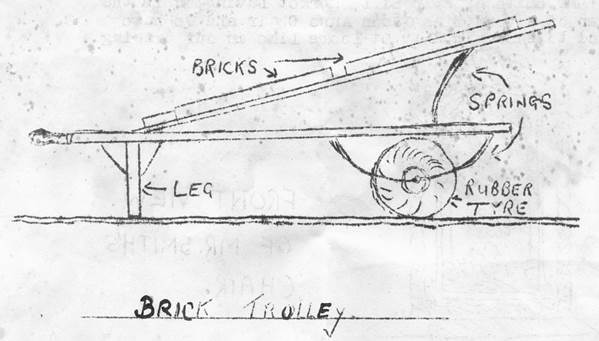 After about three weeks of weathering it is then ready for moving into the brick making machine and is loaded onto a truck which is pushed by hand along rails to a turntable at the factory end of the pit. From here it is hauled up the steep slope by a cable pulled by an electric motor. In the factory the clay is tipped from the truck to a hopper where it is ground, damped down, and then thoroughly mixed. The screw motion in this hopper forces the mixture slowly out to the presses and guillotine, a wire knife which cuts the clay into ten bricks at a time. The bricks at this stage are called green bricks and have to stand for about two weeks to weather before being placed in the kilns for baking. The kilns take about three days to heat up to the required temperature of 1000 degrees Centigrade. Many types of bricks are made by hand at this factory, the black Kimmeridge clay being particularly suited to high class brickmaking. Some interesting facts about the factory in the past were told by Mr George. For example, he said he had recently found an old bill for some time in 1840 when the brickworks was an iron foundry. This bill was for’ repairing a roof of the foundry – 1 man, 1 boy for half a day, 1 hod of mortar, 2/6d’. He also said that the early brick workers at the factory got 15/- for a six day week – that is 2½d an hour. Small coal used for firing the kiln was 3/6d per ton delivered to Devizes. Mr George told us that the best brick is not the waterproof brick but that which can absorb some moisture and give it out again, or, as Mr George called it – can ‘breathe’. During our visit we also found a number of interesting fossils, some shaped like, and as large as a cucumber, and some like bones – but we have not yet found out what fossils they are. And now the drawings that accompanied the article.